PHOTO COURTESY OF NEW HANOVER COUNTY PUBLIC LIBRARY PHOTO COURTESY OF THE NORTH CAROLINA UNDERWATER ARCHAEOLOGY BRANCH C-2s, or Victory ships, under construction in Wilmington in 1945. october 2017 40 WBM PHOTO COURTESY OF NEW HANOVER COUNTY PUBLIC LIBRARY After World War II, the Brunswick River became one of four locations for the Mothball Fleet. Liberty ships and other surplus cargo vessels were laid up, ready to be recalled to service if needed. 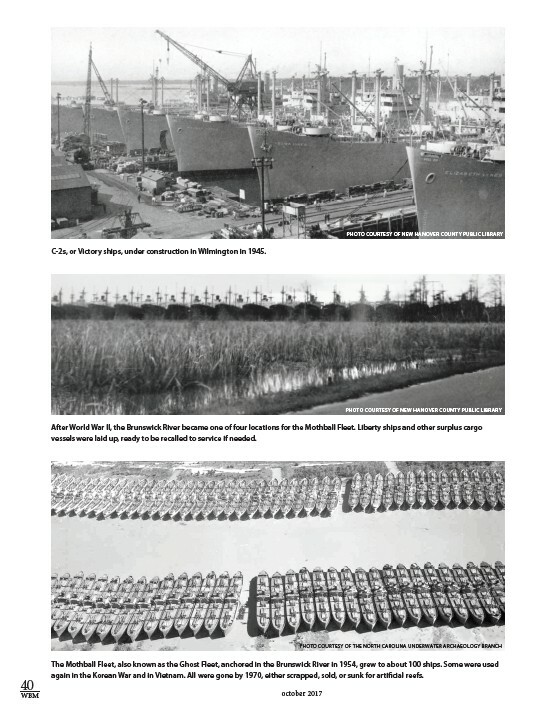 The Mothball Fleet, also known as the Ghost Fleet, anchored in the Brunswick River in 1954, grew to about 100 ships. Some were used again in the Korean War and in Vietnam. All were gone by 1970, either scrapped, sold, or sunk for artificial reefs.